Denmark and Sweden will cooperate in the field of hybrid threats, and there will be a strong focus on the problem with fake news and disinformation. This was the message in an op-ed published on Wednesday by the two countries’ defence ministers in the Swedish daily newspaper Aftonbladet under the headline “Russian fake news: a danger to our countries”. “The security situation in our region is deteriorating as a result of Russia’s military build-up”, the ministers said in the op-ed, highlighting the threat from “hybrid warfare, including various forms of cyber attacks, disinformation and fake news, which can create uncertainty in societies. When we cannot clearly distinguish fake news and disinformation from what is true, we become increasingly unsafe. We have both been exposed to this in different forms […] We will increase our cooperation in this area”, defence ministers Claus Hjort Frederiksen (Denmark) and Peter Hulqvist (Sweden) concluded in their joint statement. 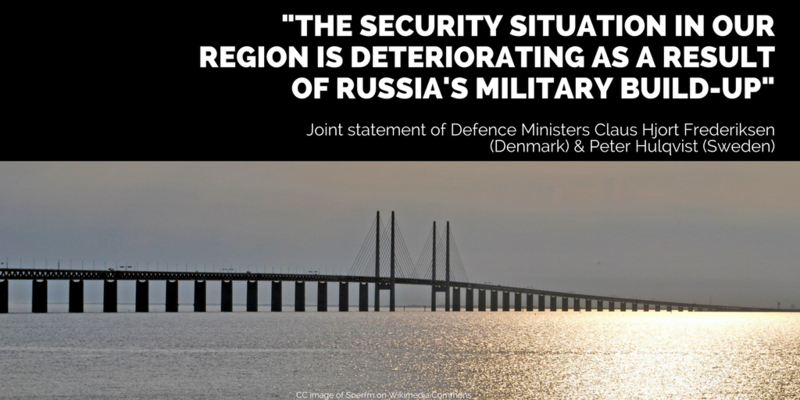 Denmark’s defence minister has already spoken openly about the threat posed by pro-Kremlin disinformation to the Danish troops which will be deployed to Estonia as a part of NATO’s Enhanced Forward Presence. In Sweden, which is not a NATO member, authorities have taken measures to raise resilience in Swedish society in the run-up the 2018 elections, due to the attempts seen in other countries to influence the outcome of elections. Both Denmark and Sweden have contributed with seconded experts to EU’s East Stratcom Task Force in Brussels, which since September 2015 has created awareness about the ongoing pro-Kremlin disinformation campaign in Europe. Imminent threat of civil war – in Sweden! Russian TV offers money for staged “action” in Sweden?